Note: Before going ahead with a training regime we strongly recommend you seek professional advice from either a qualified sports coach or qualified health professional. Often to improve we turn to strength and fitness training. 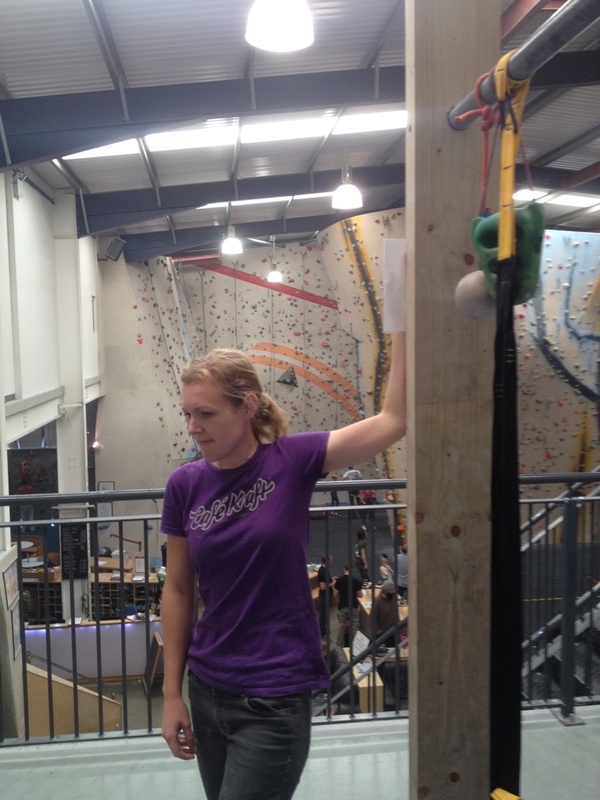 But, have you ever wondered how that climber with shorter arms can reach things you can’t. Shoulder mobility may be the answer. This article looks at shoulder mobility and how to improve it to help you gain the most from your strength and reach. 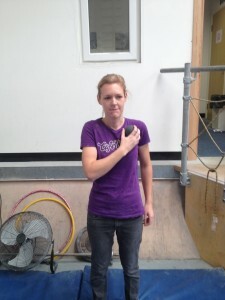 First up: To ascertain whether you have a shoulder mobility problem in the shoulder. 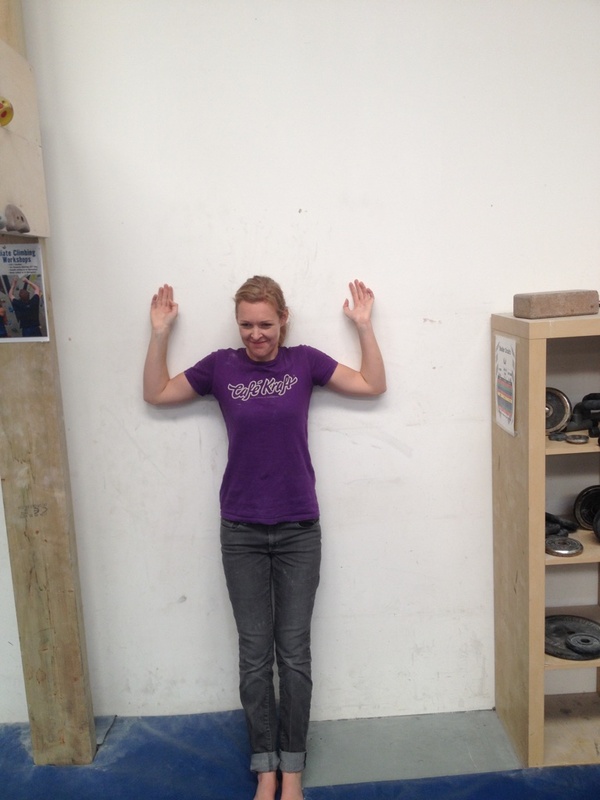 Stand against a wall with your shoulder and middle back pressed against it. 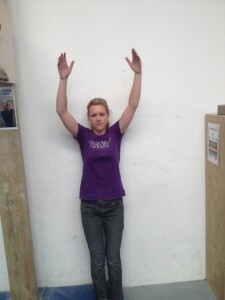 With your wrists and elbow against the wall try to raise your arms above your head, keeping your middle back flat against the wall at all times, see figure 1. 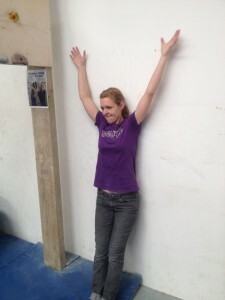 If you struggle to fully raise your arms above your head or can’t bring your elbow back against the wall, then shoulder mobility could be an issue for you. The first step of the shoulder mobility programme needs to be improving flexibility; the best way to do this is a mix of stretches and massage using a tennis ball. First of all let’s release the tension in the chest muscles using a tennis ball. With your opposite hand to the muscle apply firm pressure with the tennis ball into chest muscle for 30 seconds. Repeat for the other side. We now want to stretch out the chest and Latisimus Dorsi, the two key stretches for this are shown in figures 3 and 4, both of these should be done for a minimum of 40 seconds. Figure 3: Chest Stretch with Arm at two different Angles. With the elbow pushed against the wall you are aiming to extend / open the shoulder joint, and should feel a strong stretch across the chest. Once we’ve stretched and massaged the muscles we can start the shoulder mobility exercises. The first exercise is to return to the Wall Angels we tested ourselves with at the start (see figure 1). Your aim is to do 8-12 repetitions and 3 sets of this. You should feel a stretch of the shoulders as you get to your limit, but should stop if there is pain of discomfort. 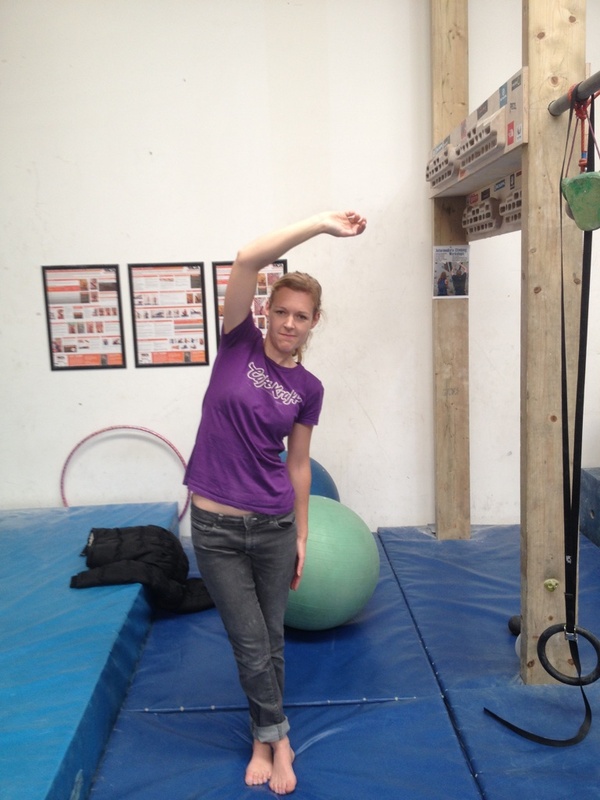 The next two exercises are Shoulder Flexion (Figure 5) and Should Abduction (Figure 6). Once again we are aiming to do 8-10 repetitions and 3 sets. With all these exercises it’s vital we keep good posture, engaging our core and keeping our middle back as flat to the wall as possible. 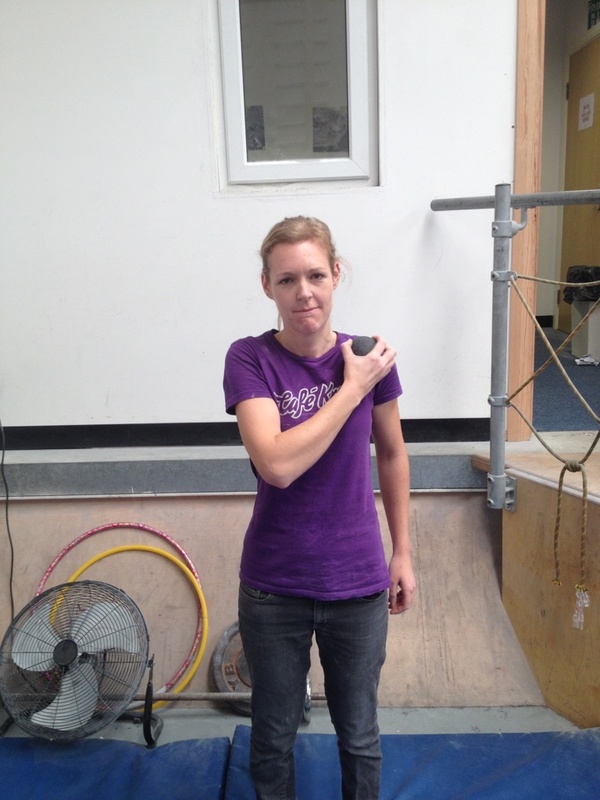 Figure 5: Shoulder Flexion Exercise. With thumbs pointing upwards and palms inwards towards your thighs the arms are extended away from the body and above the head. At all times the middle back is kept flat against the wall. Figure 6: Shoulder Abduction Exercise. With thumbs pointing upwards and palms facing away from the body the arms are abducted away from the body with the arms and elbow sliding up the wall. At all times the middle back is kept flat against the wall. Shoulder Mobility video showing three mobility exercises. Note: If you are finding it difficult to improve following these steps for 5 weeks, it can be that weaknesses in certain muscle groups or joint restriction in the shoulder, chest or spine are present. To assess further it is recommended that you seek out a professional who can isolate the problem. 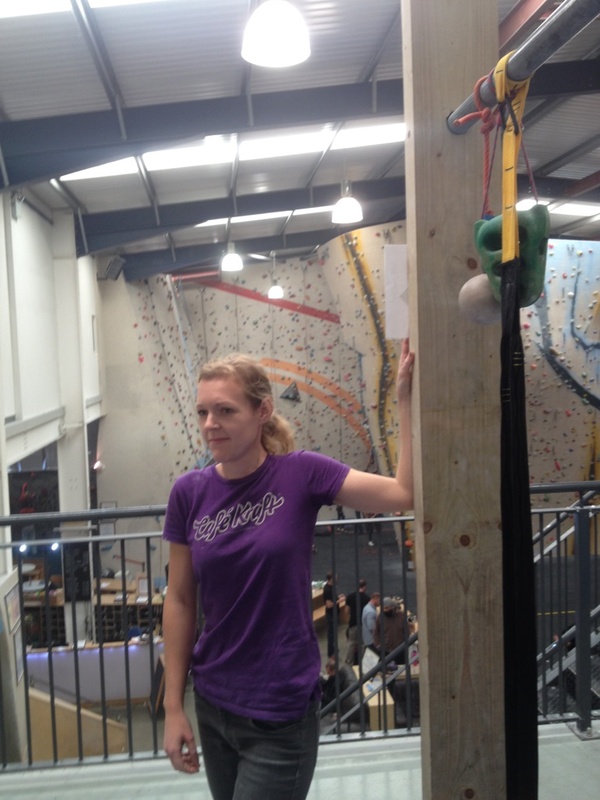 Onsight Coaching strongly recommends Alex Haddow at Care for Health.